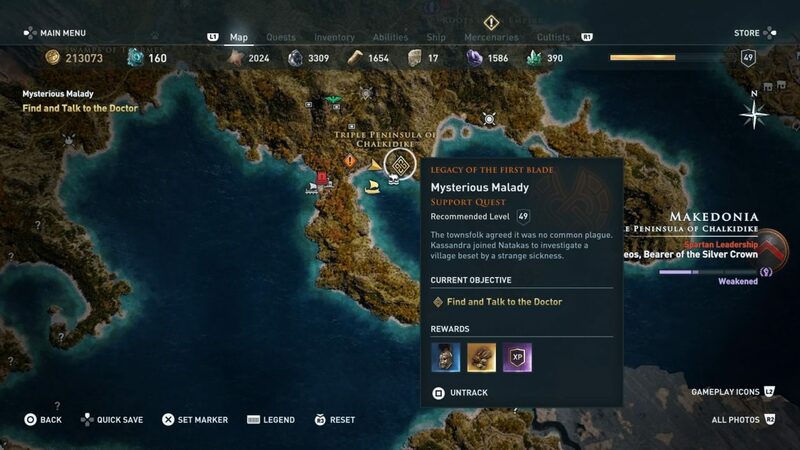 Assassin’s Creed Odyssey Mysterious Malady Quest Guide – Is the Doctor or the Magistrate guilty? 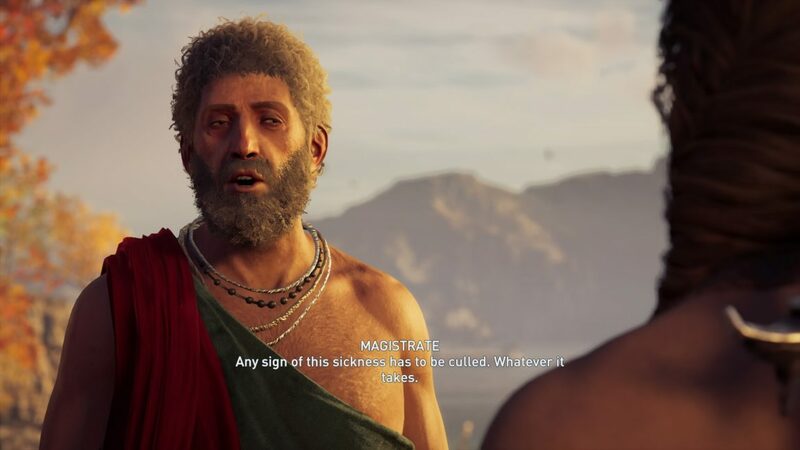 Early on in the first episode of the Assassin’s Creed Odyssey Legacy of the First Blade DLC, you’ll be introduced to the mysterious Order of the Ancients by the equally enigmatic Darius. The Eagle-Bearer agrees to help track down leads on Order members’ whereabouts, with one appearing in town of Potidaia. Here’s how to complete the Mysterious Malady Quest, and find out whether the Doctor or the Magistrate is guilty. Tracking the Order in Potidaia, the Eagle-Bearer finds the town beset by a sickness, and the only person who can help, the benevolent town doctor, is missing-in-action. First, talk to the Magistrate and learn about the sickness, before agreeing to go and look for the Doctor. Head directly east from where you had your conversation with the Magistrate and you’ll find a beach. Walk east along the coastline and you’ll eventually find the Doctor, who’s being attacked by some bandits. Kill the dudes and Timosa the doctor will ask you to retrieve her stolen ingredients from the seafaring bandits. Run over to your ship – which should’ve helpfully spawned near the shore – and track down the baddies using the quest markers. There are two ships that you need to defeat. Take care of them as you would any others. 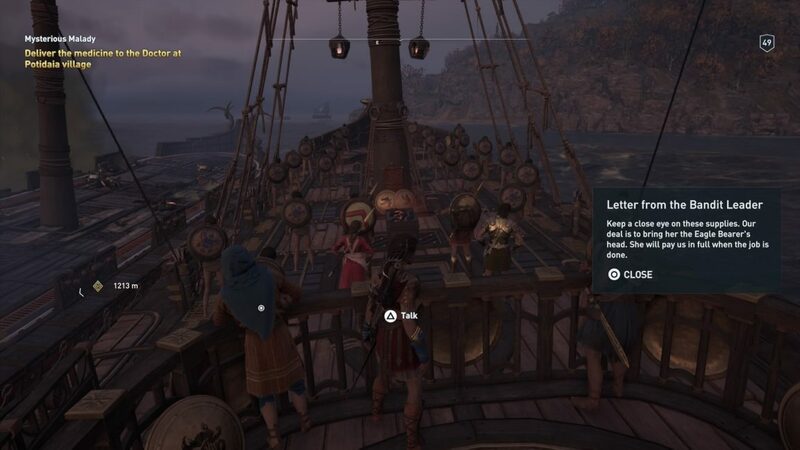 Once you’ve taken down the second ship you’ll collect a letter from the Persian Elite soldier which lets on to a couple of interesting hints. Persian soldiers? “She will pay us in full”? Who could that be? Is the Doctor or the Magistrate guilty? Sail back to Potidaia and interrupt the argument between the Magistrate, Doctor, and Natakas. 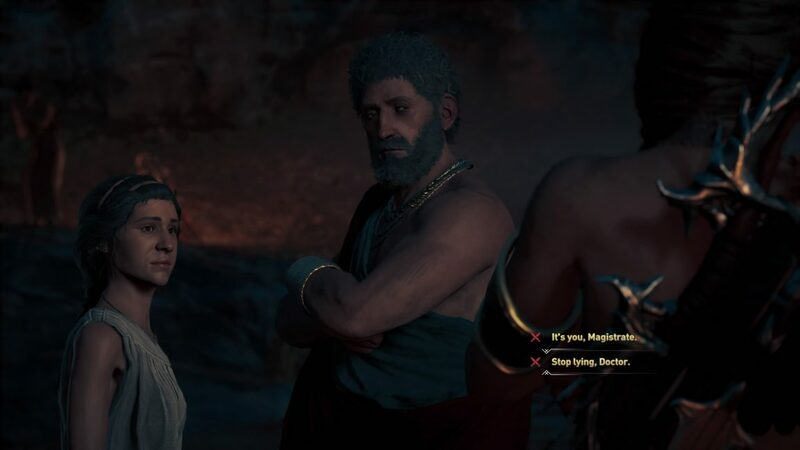 Based on the hints in the letter you got from the Persian Elite, you can accuse Doctor Timosa of lying. With the game up, she’ll sick some thugs on you and pull out a knife. Kill all three, and get you’ll get the Persian Elite Arm Guards, as well as the satisfaction of rooting out another covert member of the Order. For the locations of every member of the Order of the Ancients in the Legacy of the First Blade DLC, check out our full page.